← Census 2016: Housing In Ireland – What has been happening in the Western Region? What are the levers for effective regional development? ‘What are the levers for effective regional development?’ was one of the most interesting questions posed recently by the Department of Housing, Planning, Community & Local Government in its recent ‘Issues and Choices’ consultation paper for the National Planning Framework. In our WDC Submission to the consultation, we drew on previous WDC analysis including the WDC Policy Briefings ‘Why care about regions? A new approach to regional policy’, ‘Education, Enterprise & Employment – How Can Better Integration Of The 3Es Drive Growth In The Western Region?’ and ‘e-Working in the Western Region: A Review of the Evidence’ as well as other research to answer this question. In our submission we argue that Infrastructure, the ‘3Es’ (Enterprise, Employment and Education) and Innovation are the key levers for effective regional development. The central aim of regional policy, the National Planning Framework and the upcoming Regional Economic & Spatial Strategies should be to provide the conditions for regions to grow and realise their full potential. Developing infrastructure, the 3Es and innovation is the way to do this. When these three areas complement and support each other, they drive regional growth. Each has a distinctive role, and needs its own policy focus, but they are most effective when addressed through an integrated regional policy approach. 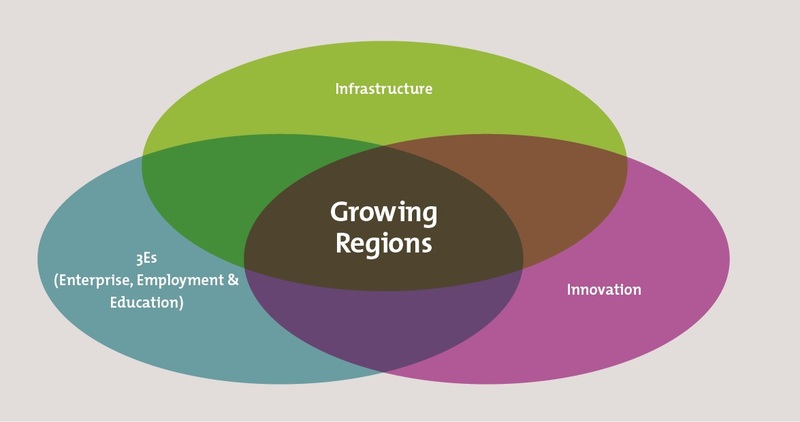 Growing Regions, WDC (2010), Why care about regions? Investment in infrastructure has always played a prominent role in regional policy. The expectation that improvements in physical infrastructure will generate productivity gains for local businesses and increase the attractiveness of an area for investment and for tourism has been a recurring theme. Less developed regions need to have a similar quality of infrastructures for their residents and businesses as is available in more successful regions. Infrastructural connectivity has a critical influence on choice of location for both indigenous and foreign investors. The Western Region, and particularly the North West, is disadvantaged in terms of several forms of infrastructure. For example Sligo was the only NSS Gateway which was not connected to Dublin with a motorway under the Major Inter-Urban motorway investments between 2006 and 2010 and was the only NSS Gateway or Hub to have a 0 improvement in its ‘accessibility to employment’ score as a result of this period of intensive investment, according to research by Transport Infrastructure Ireland. In its submission to the NPF, the WDC makes a range of specific recommendations in relation to infrastructural investments needed to facilitate development in the Western Region. The proposed investments include transport (national roads, regional and local roads, public transport (rail and bus), air and ports), communications (broadband and mobile coverage) and energy (electricity and natural gas). These infrastructure investments are also highlighted in the WDC’s submission to the Mid-Term Review of the Capital Plan. While infrastructure is critical, OECD work emphasises that transport and other infrastructure developments are not enough by themselves; to have an impact on regional development they need to be associated with, and complemented by, human capital and innovation developments. Regions are successful because enterprises in these regions are successful. When enterprises grow, employment grows and this depends on skilled and educated people. Policy to support the ‘3Es’ of enterprise, employment and education must work together at both national and regional level to create dynamic regions. One of the most important issues that needs to be recognised and addressed by the NPF is that narrow definitions of ‘job’, ‘work’ and ‘employer’ as a full-time permanent employee travelling every day to a specific work location is extremely limited and does not recognise either the current reality of ‘work’ or the dramatically changing patterns likely to emerge up to 2040. Self-employment, the ‘gig’ or ‘sharing’ economy, contract work, freelancing, e-Working, multiple income streams, online business are all trends that are dramatically redefining the conception of work, enterprise, and their physical location. A study conducted for Vodafone in 2016 found that nearly one in four broadband users in rural Ireland use the internet at home in relation to their work and one third have remote access to their company network. An estimated 150,000 rural workers avoid commuting some or all of the time because they can connect to work remotely. This trend is likely to continue. If the NPF mainly equates the term ‘employer’ with a large IT services or high-tech manufacturing company, many of which (though by no means all) are attracted to larger cities, then it will only address a small proportion of the State’s population and labour force, and will not help to achieve effective regional development. The NPF must recognise and support existing and new sole traders, micro-businesses and freelancers working in sectors where lagging regions have comparative advantage or which are not location dependent. Quality of life is a key determinant in the location decision of many people and current trends in the world of work and technology will increasingly help people to work from the same location where they want to live. Enterprises create most jobs. The NPF must recognise the need to enable and support the diversification of the Irish economy. It must provide a support framework for indigenous business growth. Many of the references to enterprises in the NPF Issues and Choices paper focus on high value, high skill exporting enterprises, which are central to export-led growth and tend to cluster in cities and larger urban centres. However such enterprises cannot provide a full solution for regional development or jobs growth. While they play a significant role, and have considerable multiplier impacts in other sectors, direct employment in such enterprises only accounts for one in five jobs nationally (2016 there were a total of 400,985 jobs in IDA and Enterprise Ireland supported companies nationally (DJEI) which was 19.5% of total employment (QNHS, Q4 2016)). Enterprises in employment-intensive, lower-skill sectors are central to maintaining and growing employment both nationally and regionally. This is termed a ‘whole of enterprise’ approach acknowledging that enterprises across all sectors have the potential to innovate and increase productivity but vary in how they contribute to growth and employment. If the NPF focuses too narrowly on high skill, high growth enterprises and/or Foreign Direct Investment it will not lead to effective regional development. Recognising the role and needs of entrepreneurs in local and personal services is important for sustaining as well as creating jobs, in particular in smaller centres and rural areas. 93.1% of registered enterprises in the Western Region are micro-enterprises, employing fewer than 10 people, and in general the region is characterised by smaller enterprise size (CSO, Business Demography 2014). While Ireland has emerged from recession, enterprise numbers are not back to pre-recession levels and even more so in the Western Region and particularly more rural counties. Between 2008 and 2014 (latest data available) the Western Region lost 8.6% of its enterprises, compared with a loss of 2.4% nationally. Construction, Wholesale & Retail, Professional Services and Accommodation & Food Service are the largest enterprise sectors. Indeed fewer than 5% of the Western Region’s enterprises are in the Financial & Insurance and Information & Communications sectors combined. The region’s enterprise base is currently quite concentrated and diversification of the enterprise base is a key objective. As stated in the NPF, a skilled workforce will attract high value enterprises to a region, but a skilled workforce are less likely to locate in a region unless the job opportunities already exist. In reality this relationship is not so straightforward. Job opportunities are a critical, but not the only factor in people’s decisions on where to live, many other personal and social factors influence this decision. In Ireland many people have selected to live in one location but commute to work elsewhere in some cases e-Working for a number of days a week. Equally, areas with large pools of skilled labour e.g. counties in the wider Dublin commuter belt, have not necessarily been able to attract employers to locate there instead. 40% of workers living in the Mid-East region work in a different region. In general, lagging regions have substantial reserves of unmobilised labour, indicated by higher unemployment rates and lower participation rates. During the Celtic Tiger this pattern was largely reversed in the Western Region with rising participation rates, falling unemployment and high levels of inward migration as many people returned to the region on response to economic growth opportunities. The WDC’s LookWest.ie campaign effectively illustrated many case studies of individuals and enterprises who (re)located to the region at that time. Labour markets in lagging regions have the potential to respond very positively to improved economic circumstances and stimulus. The recession however led to high out-migration, which is particularly detrimental to lagging regions, as the propensity to migrate is higher among the more skilled, depriving the region of their skills and leaving the less skilled more dependent on local employment opportunities. The creation of job or entrepreneurial opportunities for graduates in lagging regions will help retain and attract a highly skilled labour force and, in turn, stimulate further growth and employment. A key characteristic of the Western Region is that 1 in 5 people who are at work in the Western Region is self-employed (75,000 people were self-employed in the Western Region, QNHS special run, Q1 2016). While farming influences this to some extent, self-employment is higher in the region across most sectors and is particularly important in the most rural counties. Provision of serviced, shared workspace including through Community Enterprise Centres, at a reasonable cost. Mentoring and provision of grants for start-up and established businesses. Network facilitation to allow self-employed, particularly in more rural areas who may be quite isolated, to connect with others in other own or other sectors. Training and upskilling for owner/managers and self-employed across all sectors including personal services (hairdressing, childminding), building trades, retail and hospitality. What is most interesting in recent trends is that since 2012 there has been quite strong growth in the numbers self-employed who are employing other people (from 14,200 up to 19,000) showing the potential for the self-employed to be job creators. Further and higher education has an important role to play in regional development. Educational institutions build a region’s human capital assets, attract and retain talent. Further education and training have a particular role in up-skilling those with lower education levels, who face higher unemployment rates and are at greater risk of long term unemployment. Lagging regions generally have a greater share of their labour force with lower levels of education. In 2011 54.7% of adults in the Western Region had only secondary level education or lower, compared with 51.9% nationally. Higher education brings knowledge creation, knowledge transfer, cultural and community development and innovation to regions. It can also stimulate entrepreneurship. Within the Western Region, NUI Galway is a key regional asset and economic driver. It greatly contributes to the attractiveness and economic development of Galway city and its wider hinterland. To the North West the three Institutes of Technology of Letterkenny, Sligo and Galway-Mayo, are collaborating on the Connacht/Ulster Alliance, an initiative that has the potential to expand the contribution of higher education to regional development in this area. The broader role of further and higher education, touching on innovation, enterprise and employment, needs to be a key focus of regional policy. Where this works effectively it becomes part of a virtuous cycle producing graduates and skilled workers, and enabling them to find employment in developing enterprises. To remain competitive, manufacturing and service firms must continually upgrade skills and capabilities, access new ideas and technologies through industry networks, tap the knowledge of their workers, suppliers and customers and search for new market opportunities. This is all innovation. Innovation policy is often focused on scientific and technological research, but while leading OECD regions produce several hundred patents per year per million inhabitants, more than one third of OECD regions generate fewer than ten patents per year. Lagging regions need a different kind of innovation policy, one that emphasises absorption capacity and innovation by adoption. Policy needs to address the issues of regions that are not innovation leaders. A substantial element of innovation policy should be focused on adoption of innovations developed elsewhere and on initiatives in areas such as human resource management or implementation of new processes. It should stimulate innovation activity in areas where rural regions have particular strengths such as renewable energy and agri-food. Regional policy which addresses the levers of effective regional development – Infrastructure, the 3Es and Innovation – through a co-ordinated, place-based, cross-sectoral approach is needed if the so-called, ‘business as usual’ spatial pattern of growth is to be disrupted and all regions facilitated to realise their potential for economic growth and provide sustainable livelihoods for those who live there. This entry was posted in Economy, Employment, Enterprise, Infrastructure, Regional Development, Regional Statistics, Rural Development, Transport, Uncategorized and tagged effective regional development, employment, Enterprise, Infrastructure, labour market, regional disparity, Regional policy, Western Region. Bookmark the permalink.